Global Home Bulk Orders Available! Healthy products from remote regions of the world! Check out our recent service projects & fun! 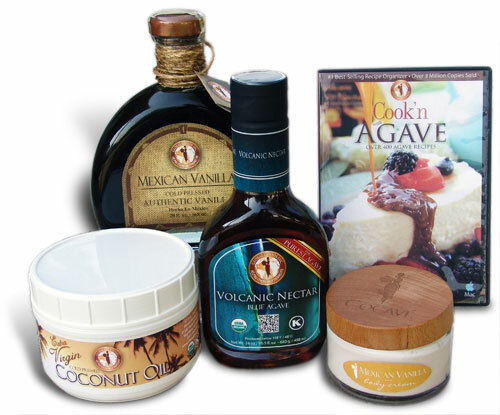 The world's first coconut oil, coconut water, agave nectar lotion, shampoo and conditioner. A unique combination of anti-bacterial, anti-aging, hydrating electrolytes used to replenish and rebuild your skin and hair. No Parabens (man-made preservatives) or Sulfates. Pure white, organic, extra virgin, unrefined, cold pressed coconut oil with a sweet taste! Produced under 118 F without harsh chemicals, solvents or bleach. Organic agave nectar grown from family farmers, produced without chemicals, nor excessive heat (less than 118 F), and doesn't contain common fillers found in other agave's like sucrose, maltose or high amounts of fructose. Authentic vanilla from Mexico produced from the flavorful vanilla bean. It's alluring scent will change the way you bake! #1 Best-Selling Recipe Organizer with over 3 million copies sold! Start with over 400 Agave Recipes tried, tested and approved. Quickly convert your non-agave recipes into healthy agave recipes, adjust serving sizes, easily enter your own recipes, capture recipes from the web conveniently, analyze nutritional values, print a cookbook, make menus, shopping lists and more! © 2016 Global Goods Inc.